So my arm is still really hurting. I went to knitting last night and tried to take it easy. I came home early. We all wanted to watch some Olympics coverage but I could not cope with just sitting in front of the TV doing nothing. Honestly, how do non-knitters do that? So I had Wes help me bring my wheel upstairs and did some long-draw spinning. 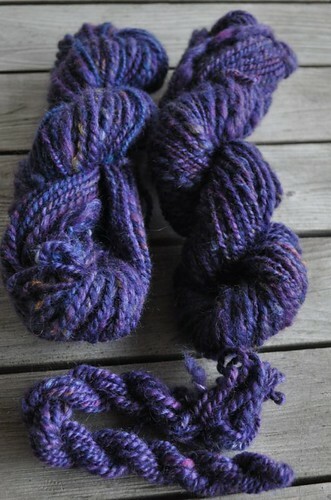 It didn't hurt my arm and I spun 7 oz of mystery wool/mohair/whatever from Dawn's Custom Carding. I had it all plied before bed. I tried to follow Judith MacKenzie McCuin's advice for worsted--under-spin the singles and over-ply it. This yarn came out fairly dense though since I was spinning more for sanity than for style.